What began two years ago as a training camp with a few players and coaches has evolved into an internationally-recognised annual wheelchair basketball clinic drawing over 150 participants from as many as 20 states across India. From 22-26 June, 2016 the first of its kind national technical camp was organised by the Wheelchair Basketball Federation of India (WBFI) in partnership with the ICRC, the Sports Authority of Telangana State and Cognizant where instructors from the International Wheelchair Basketball Federation (IWBF) trained 75 upcoming para athletes, along with 80 coaches, referees and classifiers. Coming from different cultural backgrounds and belonging to diverse age groups, the first-time participants as well as those who have regularly attended such trainings formed an eclectic mix. The excitement on the concluding day was palpable as India played its first international match against Thailand in front of a 200-strong crowd. Wheelchair basketball has emerged as an incredible catalyst for social inclusion of persons with disability — by not only infusing new vigour in their lives, but also by bringing about a change in perception of others in society towards them. In less than two years, nine state-level teams and two women teams have been developed. 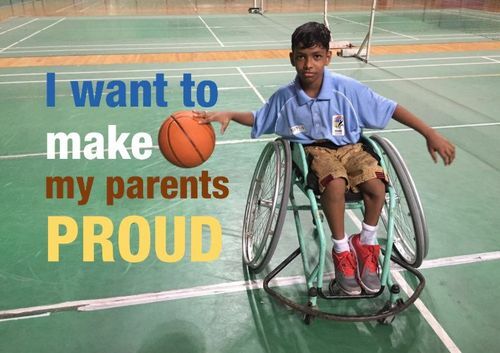 Be it 11 year old Nikhil from Delhi, Tamil Nadu’s Jagannathan or Telangana’s Baljeet Kaur Bagga — for all of them, this sport has been crucial in removing the “distinction of disability”. Pavan Kashyap from New Delhi sums it up to a tee. “I want to make something of myself and make my parents proud. And I can see myself doing that when I play wheelchair basketball,” says the 13 year old.